Welcome back, I’m glad you stopped by. 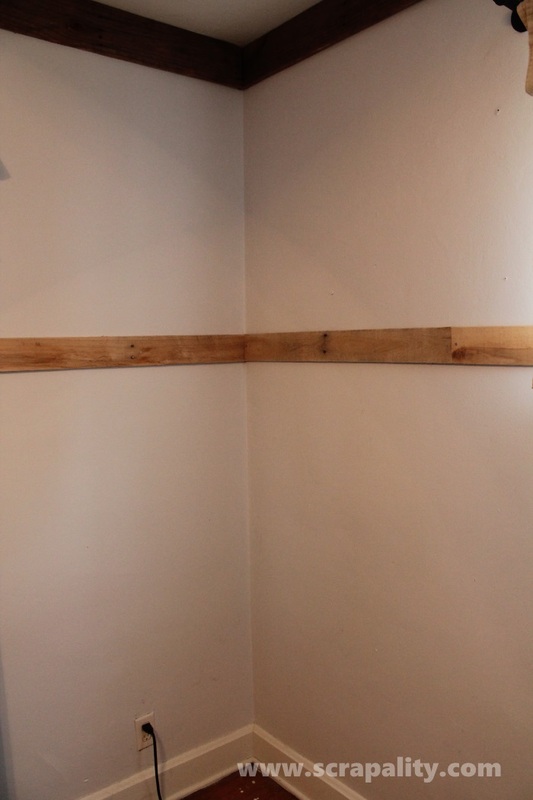 Over our holiday break I completed a new DIY house project that involves pallet wood. I’m a huge fan of wainscoting. It adds a comforting homey feeling not to mention a designer look. It’s so inviting. It makes me want to grab a cup of coffee and chat for a while. Speaking of coffee… grab a cup of coffee and let me show you how I got the look without the cost. 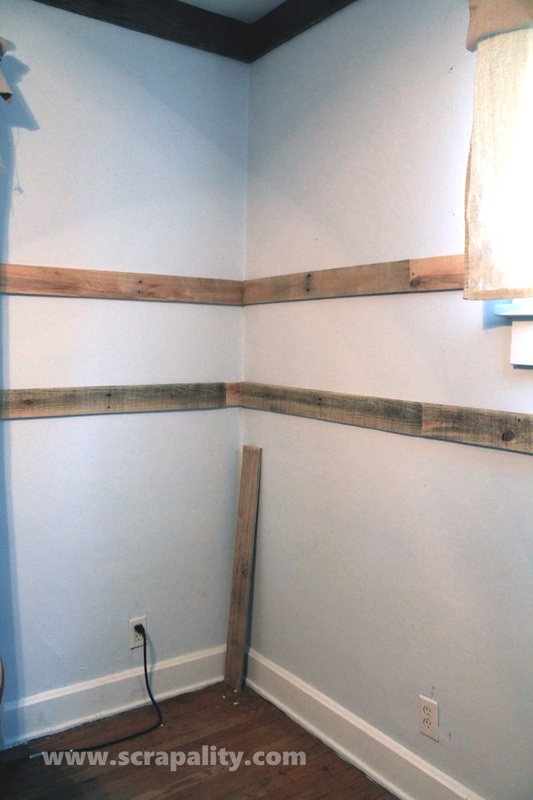 To start off, I nailed the top boards to the studs in the wall at the desired height. I also applied builders adhesive to the back of the boards. Next, I added the second row. I measured and used a level to keep the distance the same along the wall. I then added boards connecting the two boards. Next, I added the lower vertical boards. Using a caulking gun and paintable caulking, I filled all the holes, knots and cracks. I then added a bead of caulking where the boards met and along the sides of each board. After everything was filled in and dry, it was time to paint. I’m loving the new look. It’s not perfect, by any means, but I works. I’m loving the new look. The only items I had to purchase were the adhesive, caulking and paint. Well, what do you think? Drop me your thoughts below. I can’t wait to hear from you. I’m linking this project up to some fabulous parties. Stunning and amazing! 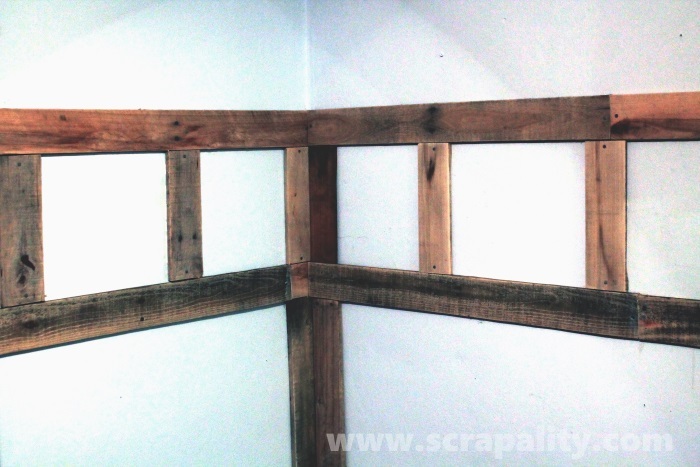 As is everything you make from pallets! I’m a fan!!!! This is a great idea and a great look! Well done. I love it. Your room looks so different. Visiting from My Uncommon Slice of Suburbia. Wow! I would have never thought to do this using pallets! What a different look! I love it. This is so GREAT! It looks like it’s a dining room/kitchen area? Did you only do that room? How long did it take from start to finish? LOVE IT. 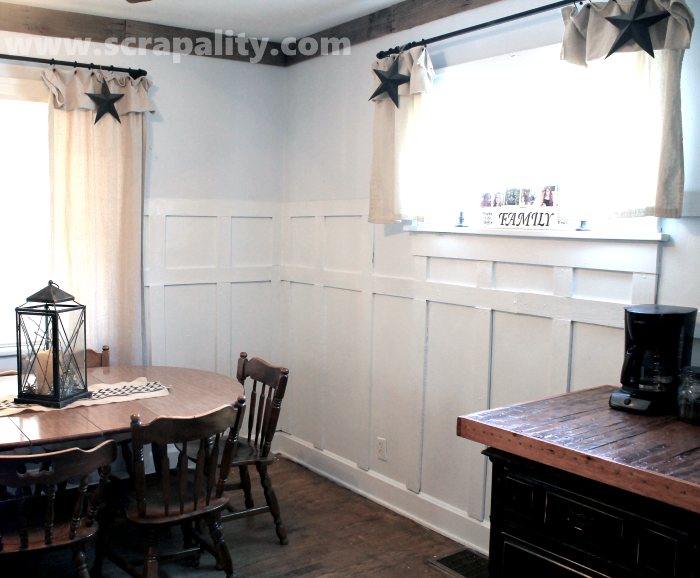 I love using pallet wood and never thought to use it for wainscoting. Great project! Wow, this is totally beyond amazing. Thanks tons for linking to Inspire Me. This looks awesome. I love it. OOH! I have to do this in our dining room! I have a bunch of pallets that would work perfect for this! It’s so classy looking! Great post! Wow Andrea! I’m just so impressed with your mad power tool skills!! 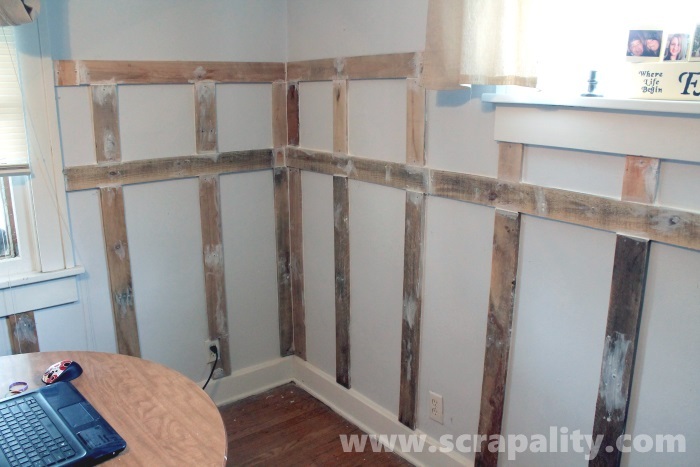 This wainscoting looks great and I think you did an excellent job dear Gal. I love how it brightened that whole room and brought a nice textural and architectural element as well. Love this look! Great job and so thrifty too. Wow, what a great idea! I would never have thought to use pallet boards to create this. Really turned out nice! Thanks for sharing with SYC. Wow – that looks great! I might have to learn how to use some power tools! You would never know it’s pallets! Beautiful! Pinned it to my Repurpose board. 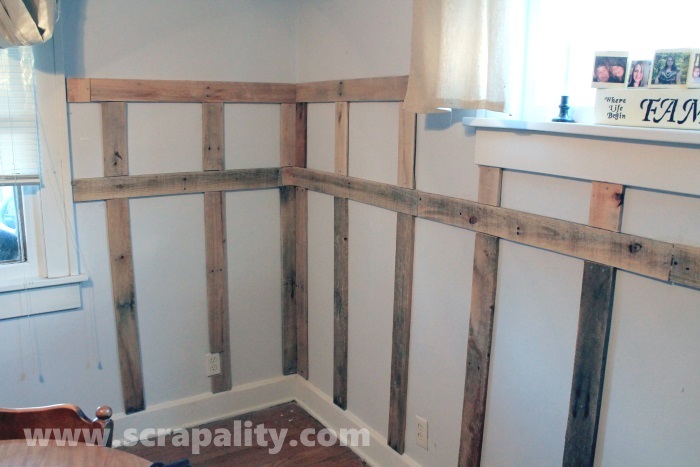 This turned out beautiful and looks like an original feature of your house ! Looks wonderful!! Love that you used pallet wood to create it! Great job! I am a hugh fan of pallet art and love the your wall detail. Thanks for sharing. Totally awesome!!! I think it looks fantastic and was such a terrific price! Thanks for linking it to Monday Funday. Sharing on FB! Looks GREAT, Andrea! Featuring you at my place this week. Thanks so much for linking up at the Wildly Original linky party! 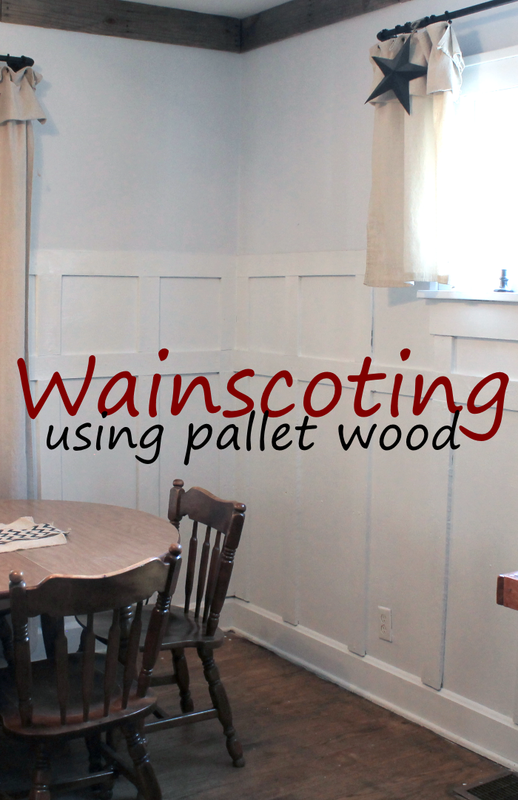 I never thought to use pallet wood for wainscoting. What a genius idea! I’m so glad you shared this at the Frugal Crafty Home Blog Hop because this post will be on of the features at our next party! Yay! Pallet wood is usually warped. So using a planer and/or jointer would be a huge plus. Hello, I check your blogs on a regular basis. Your story-telling style is awesome, keep up the good work!